This month we will be exploring Dance Standards_7: Perceive and Analyze Artistic Work. 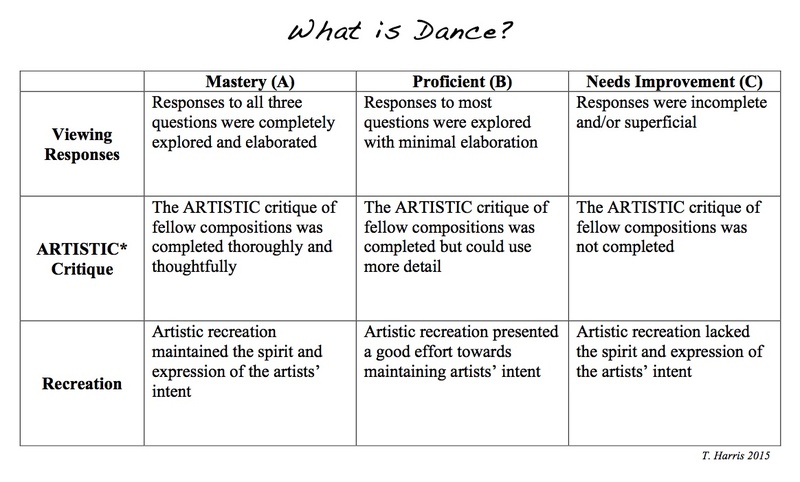 Anchor Dance standards 7 focuses on the artistic process of responding with the component of analysis. The enduring understanding is how dance is perceived and analyzed to comprehend its meaning. Although the anchor dance standards does not change as the grade level progresses the expectation continues to advance. This weeks’ lesson can be modified for all grades K-12 by changing the expectations of response, and can be viewed as a full unit taking multiple days to complete. a. Analyze recurring patterns of movement ant their relationships in dance in context of artistic intent. b. Analyze the use of elements of dance in a variety of genres, styles, or cultural movement practices within its cultural context to communicate intent. Use genre-specific dance terminology. Enduring Understanding: Dance is perceived and analyzed to comprehend meaning. Essential Question: How is dance understood? Have students choose one piece that really resonated to build a larger response. Utilizing the last response of ARTISTIC: Create, have students recreate the intent of the piece through another medium of art. For example: have students recreate the movement as a poem, visual art piece, a song, lyrics to a rap, etc. Have student perform the recreation. This could be a fun opportunity to have the audience guess the piece they are recreating, or even play the piece simultaneously with the recreated art. Human Kinetics has a great resource for this activity: Exploring Dance Forms and Styles: A Guide to Concert, World, Social, and Historical Dance by Helene Scheff, Marty Sprague, and Susan McGreevy-Nichols. It has many lessons already set up and handouts for students. It also comes with a DVD of various dances. This is a great activity to complete with beginning dancers. It gives them a chance to explore movement in a non threatening way, as well as express themselves in a way that is comfortable for them. Similarly, it gives context and background to dance as a whole, and introduces students to the rich history of the art. How can the Arts assist in the Test Prep process? Although we are an untested subject, the arts can play a pivotal role is helping students prepare for the high stakes standardized testing that they will inevitably be faced with each year.